Debbie Nordeen received her Music Education degree from Northern Illinois University. During the past 25 years of her career she has taught voice and directed choirs and ensembles, producing many concerts. Debbie also performed in professional music theatre in featured roles. Beginning her tenure as artistic director of Womansong (www.womansong.org) in 1994, Debbie combines her theatrical flair with her love of community building through music. She lives part of the year in India where she serves at the Avatar Meher Baba Charitable Trust. Her motto is: I’d like to teach the world to sing in perfect harmony. Ruthie Rosauer started singing in choirs as a youngster and currently sings with Womansong in Asheville. She saw the healing potential of music first hand when she volunteered in hospitals and nursing homes with a music therapist in Eau Claire, Wisconsin. She is also co-author of a book about the power of singing, “Singing Meditation: Together in Sound and Silence” (Skinner House, 2009). 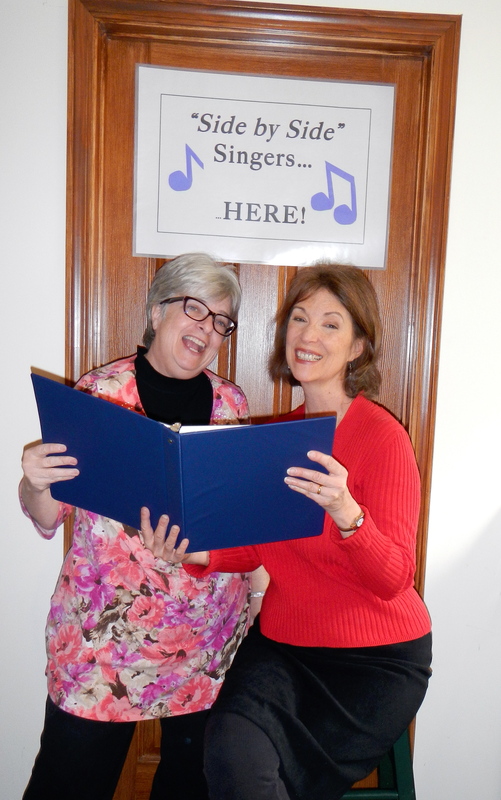 The Side by Side Singing program depends on three types of community support: financial sponsors, hosts, and volunteers. Financial sponsors support our expenses so that this program remains free to participants. Hosts provide a venue for the sessions. And volunteers are the smiles, voices, hands and hearts who meet, greet and sing with us during sessions. Former sponsors include: the N.C. Center for Health and Wellness at the University of North Carolina – Asheville, the Singing for Health Collaborative and Womansong Chorus members. Venue hosts include: Unitarian Universalist congregations of Asheville and Hendersonville, Calvary Episcopal Church in Fletcher, NC and Univeristy of North Carolina – Asheville. Do you or a loved one have a special celebration coming up — a birthday milestone or anniversary? What better way to get everyone in a festive mood than with SINGING SIDE BY SIDE? We bring the piano, songbooks, and fun — you provide the food. Organizations, group living facilities, assisted living, and retirement communities — if you are looking for entertainment, activities or programs we are happy to come to you and get everyone singing. Contact us at ruthiesong@gmail.com for price and scheduling.